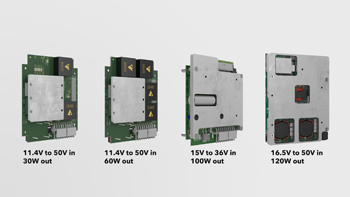 Elma has added four new, rugged power supply modules to its growing family of power solutions. The PCI/104-based PSUs can be used as the bottom module in any PC/104, PC/104-Plus, PCI-104, PCIe/104 or PCI/104-Express embedded system stack arrangement. The innovative design also allows use in COM Express based systems as well as other small form factor (SFF) embedded computing systems. Output power ranges from two outputs at 30 W up to five outputs at 120 W, combined (3.3 V, 5 V, ±12 V), and support 11.4-50 VDC input ranges for 28 VDC applications. The rugged mechanical form factor is designed for systems operating in extreme conditions typically experienced in ground vehicles and aircraft applications. For reliable operation in harsh environments, the power supplies are intended to be used in conductive cooled chassis in applications where temperatures range from -40°C to +85°C. For heat dissipation, each module is supplied with an aluminum heat spreader for attachment to the base of the enclosure. They can withstand high levels of shock and vibration typical of defense ground vehicles per MIL-STD-810G. Galvanically isolated, the DC/DC modules provide reliable signal isolation. All units ship with MIL-STD-461 EMI filtering and transient protections specifically designed for demanding power requirements per MIL-STD-1275D (vehicular) and MIL-STD-704F (aircraft). Modules are intended for use in space constrained systems designed for long term reliability in tough environments that demand input and output voltage isolation. For a more complete view of our line of embedded computing products and capabilities visit our website at www.elma.com.